In 2006, technicians from Kingsbury's Repair & Service Division in Hatboro, PA were consulted by a utility company in the southern USA about the feasibility of revamping (7) 56" [1.42 m] spring plate bearings that had been in service for more than 70 years. The Kingsbury technicians discovered that one bearing had seized and broken the anti-rotation mechanism. The cooling coil was also destroyed in the process. This, in turn, contaminated the oil supply common to other machinery along the same lubrication system, causing problems to that equipment as well. Fortunately for the utility company, Kingsbury's decades of experience with rehabilitating machinery outfitted with spring-plate bearings enabled our technicians to take on the project. Over the course of time, the springs used in such applications begin to lose their elasticity, which in turn limits the ability to form the pressurized film of oil that is essential to the bearing's operation. To address this common problem, Kingsbury engineers designed a retrofit KBV-style bearing to fit in the same envelope as the existing one, but with the added advantage of individual tilting pads supported on a series of leveling plates to provide misalignment capability and compensate for minor shaft wobble. After the successful installation of the first bearing in 2006, the utility issued an order for the remaining six sets in 2011. We recently received the used parts from the third set, and have scheduled the subsequent sets to be retrofitted every six to nine months. For each set, the customer will send us the existing housing, cooling bundle, spring plate bearing and thrust runner. We will evaluate and repair the thrust blocks and their runners, clean and paint the housings, and repair or replace the cooling bundles. 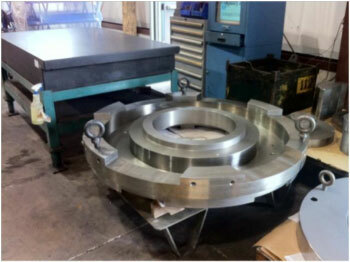 We will also make new 56" KBV-style thrust bearings, complete with high pressure lifts, to replace the original bearings. The revamped assemblies will be shipped to the site, and if necessary, we will provide field service technicians to supervise the installation.